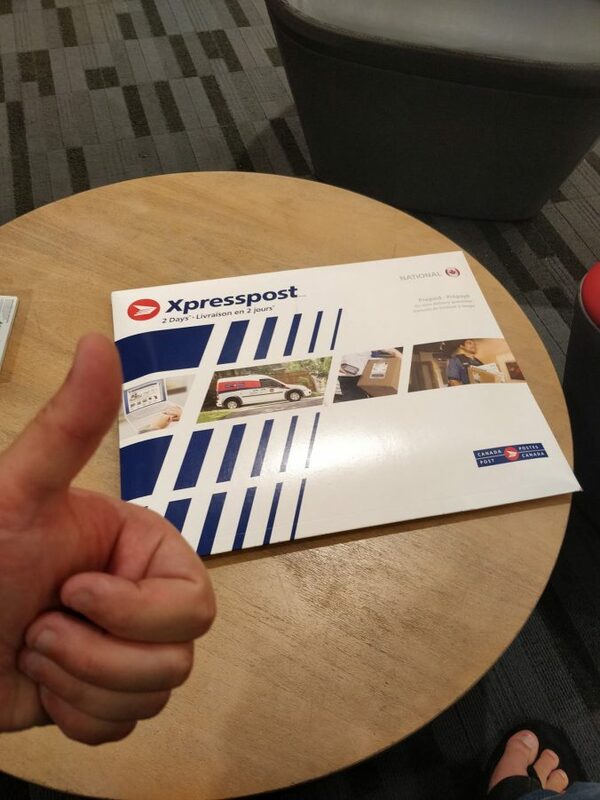 And It’s Off – My Completed Application Is In The Mail! Two days ago I picked up my new passport from the office in Surrey, BC, Canada and updated the last bit of my non-lucrative application. Afterwards I went across the street and made two full copies of the entire application, one for me and one to include in the application (since most consulates say you should include duplicates). One thing I didn’t do is submit my entire passport with the application: instead I opted to just send in a photocopy of the primary page and said in my application I will just mail it overnight as soon as they require it. I hope this doesn’t cause any issues, but with the amount of travel I do, not having my passport for three months would be difficult. 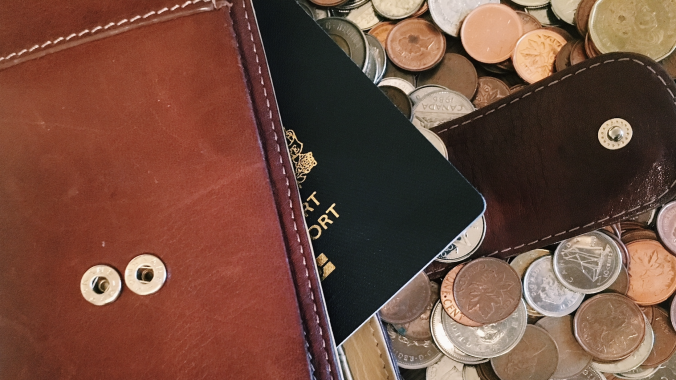 If you live in the Toronto, Ottawa or Montreal regions, you can simply go in person to start this process, and they’ll simply make a copy of your passport – when your visa is ready, they ask you to bring the passport back in and put the visa in it, usually within 24-48 hours. Unfortunately because I live in BC, Canada, I have to mail my application in to Toronto, and they ask for the passport on the website. But hopefully they’ll just process it as is and email/call me when they want me to send the original in. I did one final check of all the documentation, then put it in an Xpresspost envelope and sent it off to the embassy in Toronto. It’s a long weekend here in Canada, which means they should receive it on Tuesday, July 3rd, at which point the clock will start ticking. My current plan is to leave for Spain on October 8th, which gives me a little over three months for them to process my application (the website says three months is typical). So I’m in good shape from a time perspective. So in total I’m looking at about $947 for the application. I also renewed my passport for $210 recently, and my Sanitas plan in Spain (which was a requirement for the non-lucrative visa) is about $710/year, but those have other benefits besides just this application, so I’m not including them in the direct costs. So in short, it’s not a cheap process. Regardless, I’m happy to be done with the application process. It takes quite a bit of time to assemble everything properly, and I’m happy that time is now freed up again. With luck in a few months I’ll have a shiny new non-lucrative visa, which will allow me to live in Spain for a year or more. Wish me luck! link] Please, ONLY money order or certified cheque payable to the Consulate General of Spain in Toronto will be accepted. So, they ask that you go to another page, and then figure out the fees there. But which out of all those options are the ones you need to pay? Using some of the other embassies websites to cross check the information, it looks like the two fees that need to be paid are the Canadian citizens 22 years old or over, which is $762 CAD currently, and the Initial authorization for temporary residency, which is $16.10 CAD. A ‘money order’ in Canada is sort of like a certified cheque, but you buy it from the post office. I originally went down to my local post office and tried to buy two for the amounts listed above. Unfortunately I was quickly informed that ‘Consulate General of Spain in Toronto’ won’t work since it’s too large for the computer field that is available. I thought about shrinking it to something like ‘Consulate General of Spain’, which may have worked, but I really didn’t want to risk it. I decided to go to my bank and try the certified cheque approach. I’m not a big fan of certified cheques, since banks charge you to issue them, and they are almost like sending cash (unless you have the original cheque, they are hard to cancel). And unlike a cheque, you can’t put a stop payment on it, which means it can be cashed later even if for some reason you need to cancel it. Seeing as I didn’t really have any other choice, I asked my bank for two certified cheques in the above listed amounts. Tomorrow I have an appointment to pick up my new passport, which will hopefully be valid for 10 years. Once I have that, I am going to quickly update my application to reflect my new passport number, and then send it off. With luck I’m only about 36 hours away from sending off my completely application. As part of applying for the Spanish non-lucrative visa, one of the requirements is a negative criminal record check from the country you reside in. In my case, that’s Canada, so as soon as I arrived back from Spain I made a point of trying to decipher what exactly I needed to supply. Once again, different consulates seem to have different requirements. Negative criminal record (not applicable for minors), issued by the authorities of the country or countries where you have lived during the past five years, including Canada. They are issued by the RMCP. A Police Check issued by the authorities of all the countries where an applicant has resided for the last 5 years, including Canada. NOTE: The Police Check should be issued by the RCMP and contain the fingerprints of the visa applicant. If you go by the Toronto consulate’s definition, then it sounds like you can simply go down to your local RCMP detachment and get a name-based criminal record check. These can be done on the spot at any local RCMP location. The only catch is that if your name matches someone with a criminal record, even if they don’t share your birthday, it will throw up a flag. But that’s rarely the case, and you can get a copy relatively quickly. That said, if you go by the Ottawa consulate’s website, then you need to do what’s called a ‘certified criminal record check‘, which means you need to have your fingerprints taken and submitted to Ottawa for processing. Unfortunately these two procedures are entirely different in terms of what’s required, and also what they cost. Even though I’m applying to the Toronto consulate, I felt more comfortable doing the certified record check as this is a much more stringent check than the name-based check. I went down to my local RCMP detachment to have my fingerprints taken, which is when I hit my first roadblock. Despite me calling them a few days prior and being told I could just show up, they wanted something in writing for their files indicating the requirements for the embassy. I think they mostly want this to cover their asses in case the consulate doesn’t accept what’s given to them, but regardless it was a pretty big pain for me since I don’t currently have easy access to a printer. I quickly went home and drafted my own letter to the RCMP, including some of the excerpts from the Spanish consulate’s website alluding to the need for a certified criminal record check. I then went down to Staples (our Canadian multi-purpose print shop) and had it printed. When I returned to the RCMP, they still gave me a bit of grief since they were expecting some document that the Spanish consulate wrote for me, but I told them not only was getting a document from them next to impossible, I couldn’t even get them to answer the phone. Ultimately they accepted the letter as-is, and ushered me into the next room with the fingerprint machine. 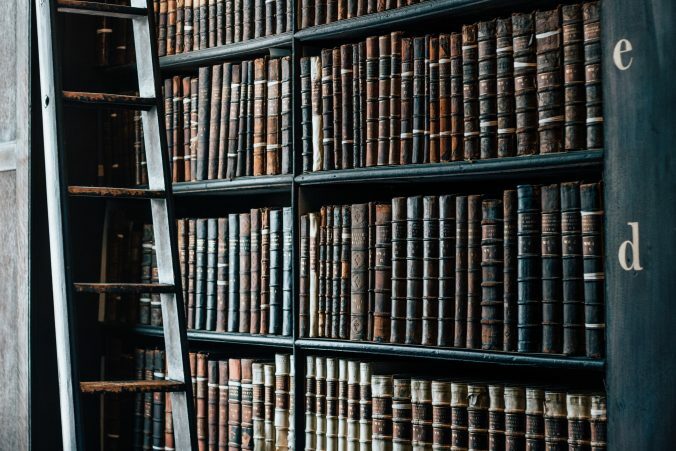 In the old days, fingerprints were taken with ink pads and paper. Nowadays it’s all done with electronic scanning, which is obviously much cleaner. They took a series of fingerprints (first your thumbs, then your fingers), redoing them as necessary to ensure there were high quality. This only took a few minutes, after which they pressed a few buttons and electronically transferred them to Ottawa. As long as there’s no criminal record found (there shouldn’t be I hope! ), I should have the final, official copy in the mail in two weeks or less. That’s really the last piece I am waiting for, after which I can mail in my completed non-lucrative visa application. The process wasn’t that painful, but if you are going in I definitely recommend coming prepared with some type of letter indicating exactly what you want. Not all RCMP detachments can take fingerprints either, so best to call ahead and make sure yours can. The final price for the check was $55 plus $25 for the electronic fingerprinting, for a total of $80. I received the final criminal record check via postal mail exactly 8 calendar days after I had my fingerprints completed. Looking at the document, they processed the scan in Ottawa the day after, and then I imagined mailed them out in the next day or two. All in all a very easy and straightforward process. 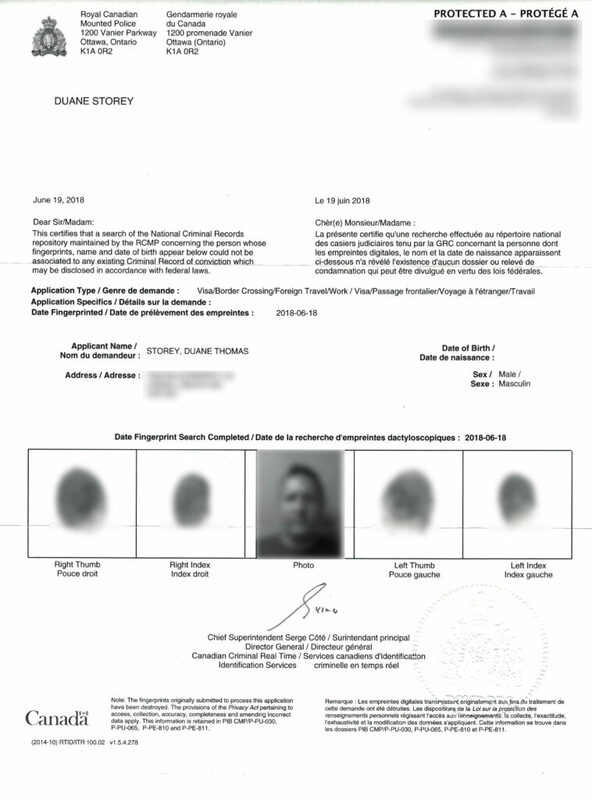 If anyone is interested, here is what the completed certified criminal record check in Canada looks like – I’ve blurred out some key features such as my fingerprints and photo (don’t want anyone impersonating me! ), but you get the idea.